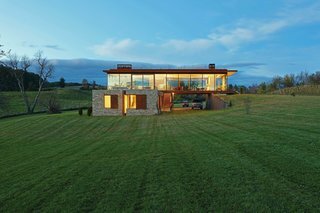 Bucolic yet modern, this environmentally conscious home in Dutchess County, New York, connects to the surrounding landscape with a natural material palette. 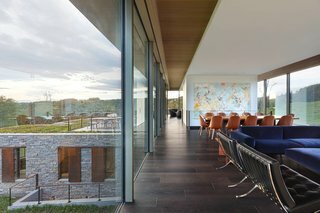 A family approached NYC–based Slade Architecture to design a new home in upstate New York that would balance privacy with openness while providing connections to the outdoors. Slade Architecture’s solution fulfills both requests. The home consists of two rectangular volumes stacked on top of each other, each oriented differently and composed of different materials. The new home is composed of two rectangular volumes stacked on top of each other. The home's two volumes are distinct not only in their orientation, but also in their materiality. The lower level is wrapped in stone, while the upper level is composed of glass. The glass upper volume contains the more public functions of the home, including the living, dining, and cooking areas. The lower level houses the more private spaces, including the bedrooms, bathrooms, and a study. 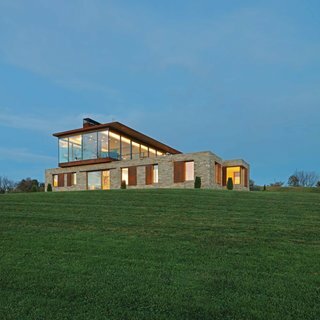 The 4,600-square-foot home is set on bucolic farmland. 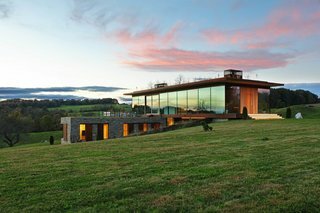 The glass upper level is designed to preserve views of the landscape. 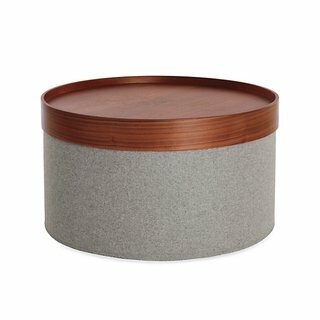 It rests delicately with one end atop the lower level and the other end on a natural hill on the site. The lower level’s stone cladding gives it a particular weight and distinction, while weathered steel accents connect the two volumes. The upper floor is wrapped in glass, with the exception of the solid wood front door and the cantilevering roof. Two volumes are stacked perpendicular to each other, and the top of the lower volume provides space for a green roof and an outdoor terrace accessible directly off the upper floor’s kitchen. Slade Architecture sourced local stone for the lower volume, creating a material connection between the building and the landscape. A green roof and terrace are accessible from the top-floor kitchen. Sustainable design was also an important factor in the residence. Each volume is oriented to take advantage of passive thermal strategies based on the home's materiality. 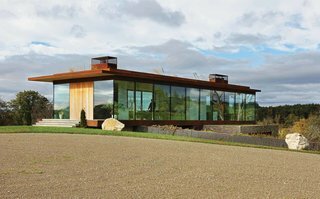 The upper floor, with its triple-insulated glazing, is oriented to conserve energy by maximizing solar penetration and heat gain in the winter. In the summer, an overhanging canopy minimizes exposure to direct sunlight. The kitchen is partially enclosed by a thick wall containing a bathroom. The dining and living spaces are completely open to each other. The lower level features superinsulated walls, and stone flooring that creates a "thermal flywheel" to stabilize the temperature. 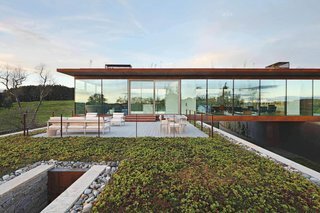 The home also draws upon geothermal wells to heat and cool the building, and radiant floors are supplemented by a geothermal heatpump-driven forced air system. The homeowners plan to use remote solar cells to provide electricity for the building, allowing the home to be decoupled from the electrical grid. 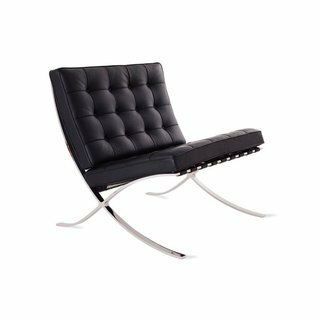 Leather dining chairs contrast smoothly with a blue velvet sofa and ottoman. 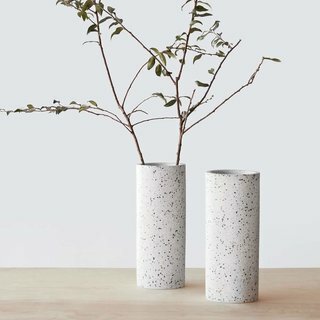 A mainstay of mid-mod decor, terrazzo is making a comeback with its artful mix of granite, marble, and quartz. On the interior, Slade Architecture sought to use materials with low embodied energy. The home features extensive wood millwork—including the paneling in the mudroom and study, the cabinetry in the master bathroom, and the ceiling in the bathroom—sourced from trees located on the farm. The lower level is clad in locally sourced stone. 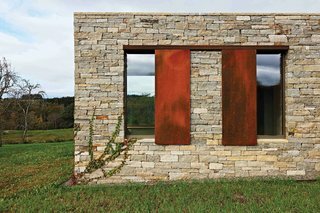 The punched windows feature weathered steel accents. Slade Architecture's approach unites the two volumes in cohesive, unified way while carrying out the desired functions and preserving sight lines to the landscape. 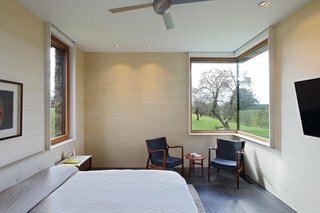 On the lower level, stone flooring and superinsulated walls help regulate temperature and reduce energy needs. 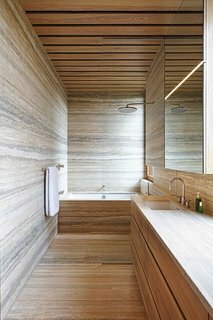 The lower-level master bath matches horizontally oriented stone with wood cabinets and drawers made from on-site trees. 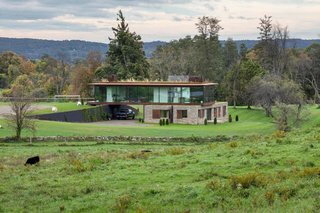 The glass second floor allows for views through the residence to the bucolic landscape beyond. On the lower level, punched windows frame select views.